Egyptian NGO Stands In Opposition to Free Speech – Why? As readers know, nonprofits around the world don’t always quite agree on issues that most U.S. nonprofits consider fundamental core values. In Egypt, where the nonprofit community is increasingly under government pressure, one NGO is not standing up for free speech and freedom of the press. Instead, the “National Centre For Defence of Freedoms” is challenging the freedoms of cartoonist Doaa El-Adl and newspaper owner Naguib Sawiris. According to the National Centre, a cartoon of Adam and Eve insults the prophet Mohammed. The offending cartoon shows Adam and Eve standing in front of an Egyptian man with angel wings and a halo “who declares the couple would have never been expelled from heaven had they voted in favour of the referendum,” referring to the referendum on the new Egyptian constitution drafted by the country’s ruling Islamists. The online newspaper pulled the cartoon an hour after the Centre posted its critique, but that didn’t deter the NGO from announcing that it would pursue legal action against the newspaper and the cartoonist. Cartoonist El-Adl stood up to the attack, asserting, “Artistic freedom in Egypt is being attacked, and this will send Egypt backwards fast.” She added, “Anyone who tries to draw something with a beard will have it interpreted as an attack on Islam.” The newspaper has drawn similar criticism before, including after the publication of a cartoon last year showing Minnie Mouse wearing a Niqab. 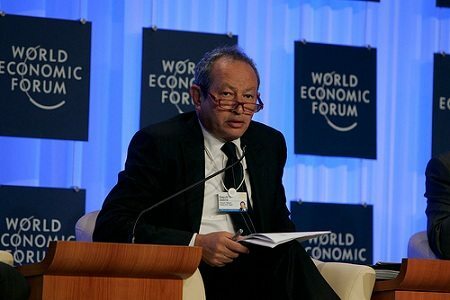 Sawiris is a Christian, according to the Daily News, which prompted Centre Secretary-General Khaled El-Masry to underscore that Christians should not be allowed to criticize Islam or Mohammed.